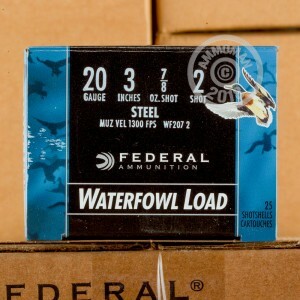 Bring down waterfowl with ease with this 20 gauge ammunition from Federal. 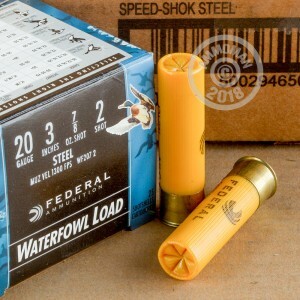 These 3" shells fire #2 birdshot pellets which are capable of downing any waterfowl thanks to their strong penetration. Each shell fires 7/8 oz. of steel shot at a muzzle velocity of 1,300 feet per second. 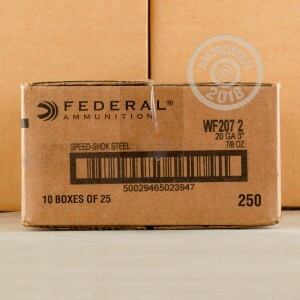 Federal Speed-Shok ammunition is loaded in Anoka, Minnesota. Each box contains 25 shells. If you're an avid hunter and want to save some cash, buy in bulk from AmmoMan.com. All orders over $99 ship for free!